SUPER BOWL XLV IS HERE! 6:18- Welcome everyone to our final NFL live blog of the 2010 season. Let’s make it a good one! As a sidenote, I’m wearing my Tom Brady jersey in honor of his second MVP. Also, I’m ready to eat…a lot. 6:20- I’ve never watched an episode of Glee and damn proud of it. I wouldn’t know Lea Michelle if she fell out of the sky on me. 6:25- Christina Aguilera does the damn thing and we’re ready to roll. I keep picturing that Dirty video every time I see here on TV. Slightly surprised the Shield tapped her for the National Anthem. 6:29 – Oh my goodness, can we start the game already? Everyone knows who these teams are at this point. Good to see Michael Douglas though. 6:31 – Newly minted Hall of Famer Deion Sanders tosses the coin and the Packers win it. However, they defer and will defend first. You know, just in case they need to pull some Sean Payton shenanigans to start the second half. Hank Baskett is not available for this one though. 6:35 – After a solid return by Antonio Brown, the Steelers opt for a safe swing pass to Hines Ward to open things up. 6:36 – A four-yard loss by Mendenhall leads to a Roethlisberger incomplete pass on third and long. Early win for the Pack since they deferr…..A MUFFED PUNT! 6:38 – Luckily for Tramon Williams, the Packers recover. 6:40 – After the obligatory one-yard run by James Starks, Rodgers guns one to Donald Driver. First down Pack. 6:41- Who has a higher yards per carry tonight? Me, James Tayor, Edgar Bennett, Dorsey Levens, or James Starks? 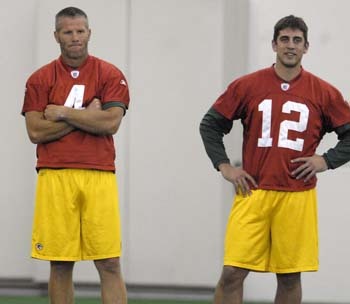 6:43- A missed opportunity for Rodgers and the man nicknamed the “Hick from the Sticks (Jordy Nelson)”. One punt for each team. 6:49- Roethlisberger misses on a 3rd and 2. Both quarterbacks are a bit high so far. Not surprising though. I need food STAT! 6:54- Wow. A little nervous for Starks on that 3rd and inches run. He gets it though. First down Pack. 6:54- Rodgers is going to throw 50 times tonight. 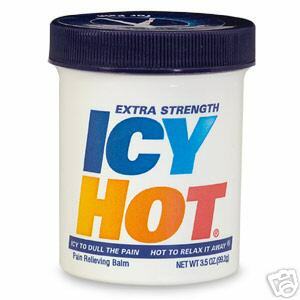 He better have some Icy Hot tomorrow. 6:59 – Too many things are happening! In the last 60 seconds, John Madden is pictured texting while sitting in between the Bush clan and Condi Rice. Meanwhile, Ashton Kutcher was sitting one row up…and to cap this off Cameron Diaz was feeding Alex Rodriguez popcorn. Too much. 7:01 – While I’m stunned from the sights, Rodgers goes up top to Jordy Nelson. They get it right this time on a 3rd and 1 from 29 yards away to draw first blood. The real A-Rod caps a nine play, 80-yard drive. 7:07 – Nick Collins foils Big Ben’s plans of going deep by PICK SIXIN’ #7. Collins scores 37 yards out. Uh oh. 7:14- Sorry. Minor food break. Roethlisberger slips and appears to have a knee injury…but scampers for a first in GB territory. 7:16- Ben’s run ends a bad first quarter for the Steelers. Penalties…a deadly turnover…and bad offensive line play. 7:17- I don’t need to see Joan Rivers as a GoDaddy.com girl. Thanks, I’ll pass. 7:21 – The Packers are roughing up the Steelers. Pitt is getting outmuscled in this game which is rather uncommon to see. 7:22 – A 3rd and 7 sees Ben throw short of the sticks to Mike Wallace. I don’t like that, especially when you’re 14-0. Nonetheless, a Shawn Suisham field goal makes it 14-3. 7:26 – The Megan Fox era is officially over. Transformers 3 coming to a theater near you on July 1. 7:30 – Ladies and gentlemen…a JAMES HARRISON SIGHTING! That leads to a Packers punt. 7:31 – P.S. If you took the over on Brett Favre mentions at 2.5, you’re so losing. 7:35 – Mendenhall is running well but it’s not leading to anything because Roethlisberger isn’t generating much downfield. 7:38 – Ben converts to Antwaan Randle-El for a first down. Pitt burns a timeout with about four minutes left before the Black Eyed Peas blow up Cowboys Stadium. 7:42 – Jarrett Bush ends Pittsburgh’s drive with an interception. Ben’s pass, intended for Mike Wallace, didn’t fool anybody. 7:44- Green Bay can effectively put its collective foot on Pittsburgh’s neck with a touchdown. 7:45 – Rodgers to Jennings right in front of Polamalu for six to extend the Green Bay lead as Todd Rundgren blasts in the background. The fat lady just changed out of her Nike sweats. 7:49 – Real-time Facebook status updates in cars?!??!?!?!!? Stop the madness. The alpha male is dying a quick death. In other news, Ben to Randle-El for 37 yards. When Antwaan Randle-El is your biggest threat in the passing game, that is a brutal sign. 7:53- The good news for Green Bay is that they lead by 18. The bad news is Sam Shields is off and now Charles Woodson is injured. 7:56- And again…for six. Hope you are ready for a pinball machine second half. 7:57- Green Bay needs to sign Deion Sanders at halftime. They are running out of peeps…and fast. Now, Nick Collins runs off. SYNOPSIS: Well, it could be worse for Pittsburgh. The only bright spot for them is Green Bay’s rash of injuries in the defensive backfield. Pittsburgh doesn’t seem to be on the ball defensively, allowing the Packers to move the ball rather easily through the air. Perhaps not the most electrifying first half in Super Bowl history but certainly a physical one. Packer and Steeler players are dropping like flies. Sit back and enjoy…the second half should be bananas. 8:23 – I can’t deal with the Twitter whine about the Black Eyed Peas. The Stones, The Who, and Springsteen were too old. This was received as “terrible.” Who do you want?!? That’s it. Let’s reunite this group for Super Bowl XLVI. 8:32 – Woodson out with a collarbone injury. Ouch. Pack opens up second half with a holding penalty. 8:35 – James Jones drops touchdown #2 of the postseason on a 3rd and 5 throw. 8:36- That is followed by a phantom 15-yard PF facemask penalty on Tom Crabtree on an Antonio Brown punt return. Cue up the Pittsburgh magic pixie dust. 8:41- Isaac Redman converts a first down inside of the Green Bay 10. Mendenhall caps the drive with a touchdown and just like that the Steelers are back in it. 8:51- Well, if you checked out the Super Bowl XLV preview, this was definitely a fear from the Green Bay side. The second half of Super Bowls is a completely different beast. They were not a great run stopping team (gave up 4.7 yards per carry during the regular season) and cannot run it. Yikes. 8:56- #7 misses a touchdown pass to Wallace. However, one play later he finds Ward for a first down to the Packer 29. 8:57- Did the Packers pack for the White House at halftime? 9:00- Frank Zombo saves the Packers with a sack of Ben which makes Suisham’s FG attempt 52 yards. He murders it wide left. Woah. Not even close….well, maybe if the posts were expanded by 100 feet to the left. 9:05- Not a good half for Tomlin. The Steelers have burned two timeouts and perhaps setup the Packers with a good chance to expand their lead after entrusting Suisham with that field goal attempt. This is not the game to gamble in the kicking game. 9:07- Green Bay’s drive stalls and they are forced to punt. They are running out of cracks to protect their defense. Boys and girls, this is what happens when you can’t bang out a seven-minute drive to protect a lead. 9:09- Pittsburgh does the three and out shuffle. 9:10- Tramon Williams gets called for a 15-yard PF penalty for unnecessary roughness after slapping a Steeler player during a punt return. GB now backed up to its own 13. 9:15- Who told Mike McCarthy to challenge the Swain catch? Geez. That isn’t close. 9:22- Someone You Tube that NFL fan spot STAT!!! 9:25- Clay Matthews ends the Mendenhall for MVP campaign by forcing him to fumble. Packers football. 9:27- Jordy Nelson goes from goat to hero. A long completion to the Steeler 1 after the team’s fourth dropped pass of the game one play earlier. 9:30- Greg Jennings catches his second touchdown pass of the game from eight yards away to finally give Green Bay some cushion. That popping noise you just heard was numerous Steeler fans popping open Iron City Beers in fear of what is to come over the next 11 minutes of game action. 9:34- You can’t come to the Big Dance and turnover the ball. Green Bay has converted three Steeler turnovers into 21 points. 9:37- I’m mulling over the Super Bowl MVP award…don’t know. Rodgers? Eh. Jennings? Not enough. I can’t possibly cast my vote for Jordy Nelson right? 9:40- That’s the Flozell Adams everyone knows and dislikes. Holding on Adams…1st and 20 near midfield. 9:42- Money time…3rd and 3 for Pitt at the GB 26. 9:42- If Mike Wallace was on Facebook, his status message would be that he just checked into the endzone. 9:44- A Randle-El two-point run makes James Starks a pivotal player if he is still in the state of Texas at this point. 9:51- Jennings over the middle for 31 yards and a monster first down. That is followed by a rare Starks sighting. Everyone keeps touting him as a star. Apparently, Mike McCarthy didn’t get the memo since they only have 11 runs to their credit tonight. 9:55- Ugh. Ball off of Nelson’s finger tips. Crosby hits a field goal but roughly two minutes left. 10:01- We are about to get a lesson in karma…I think. 10:03- Packers can’t stay in prevent…must mix it up. 10:05- Ben is incomplete on fourth down for a pass intended for Mike Wallace, who wanted a flag for early contact. Good no call! 10:06- Aaron Rodgers takes a knee. THE PACKERS WIN THE SUPER BOWL!!!!! 10:07- Sometimes, good things happen to good people…and well, you know the other side of the coin. 10:09- Presuming Rodgers will win Super Bowl MVP, which he deserves. Let’s be real. Jordy Nelson is not getting within ten yards of that trophy. 10:10- Thought the Steelers would put up more of a fight on that final drive but to win the Super Bowl, you can’t take a half off. Even Green Bay made plays in the fourth quarter to excuse their brutal third quarter performance. 10:17- Love the awkwardness of these old guys borrowing through players with the Vince Lombardi Trophy. 10:26- Aaron Rodgers got the championship belt (and Super Bowl MVP award) and now is clearly, the third best quarterback in the league. 10:27- Tomlin completes an awkward postgame interview with Chris Myers. These guys are always shocked when the coaches have little to say. SUMMARY: The best team/player won and nowadays that does not always happen (see Super Bowl XLII). Thus, the Packers clearly deserved to win. I’m not ready to call Rodgers the best quarterback in the NFL yet but he is very close. They’ll be back again assuming their team does not fall out from injuries. As a deranged youth, I used to write Green Bay’s then-GM Ron Wolf about ways he could improve the team. I got tired of seeing Dallas club them up and down the field during the postseason. The funny part is, he actually wrote back each time. That says something about their organization. The fact that he took time out his day to acknowledge some crazy 14-year-old kid meant a lot. So, I’ve always had a soft spot for the Packers and their fans. As for the Steelers, they played well for two quarters in each of their playoff games. Last I checked, to win Super Bowls teams need to be solid for most of the contest. Tonight, three turnovers became 21 points. That is your ballgame. Time to sign off for the evening on the live blog. Maybe the commish have mercy on our souls as spare us from a lockout. If not, I’ll start blogging about green tea or something. Pray for football this September. Green tea is great for health and helps in losing weight by increasing immune system. Green tea is great for skin, hair and nails so we must drink green tea regularly.